I travel a lot, too much sometimes. No that’s crazy, there’s no such thing as too much travel. I love roaming the globe, but I hate packing. It’s the worst thing. It’s the most chaotic, stressful, over-involved what-am-I-supposed-to-take-what-if-I-pack-the-wrong-things events of travel. It’s a necessary evil, the packing business, but I’ve figured out the least stressful way to make it work for me. I roll my clothes. I roll them on hotel beds one piece at a time until they’re so compact there’s extra room to do a little airport shopping. I always bring a snow globe home for my little guy and now the only way to get them through airport security is to buy them on the other side of said security. Next time you pack a bag, try it and see. You may like it, Sam I am, you make like it on some ham. Best travel tip ever! I love doing this. One of my besties taught me the skill when we traveled to Tasmania together. 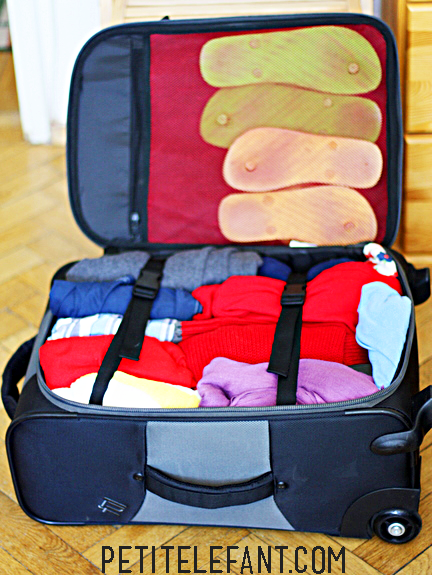 Now any trip longer than a weekend I do the roll your clothes trick. Except I rubberband mine so if I throw everything out of the bag for some reason I can easily put everything back in.